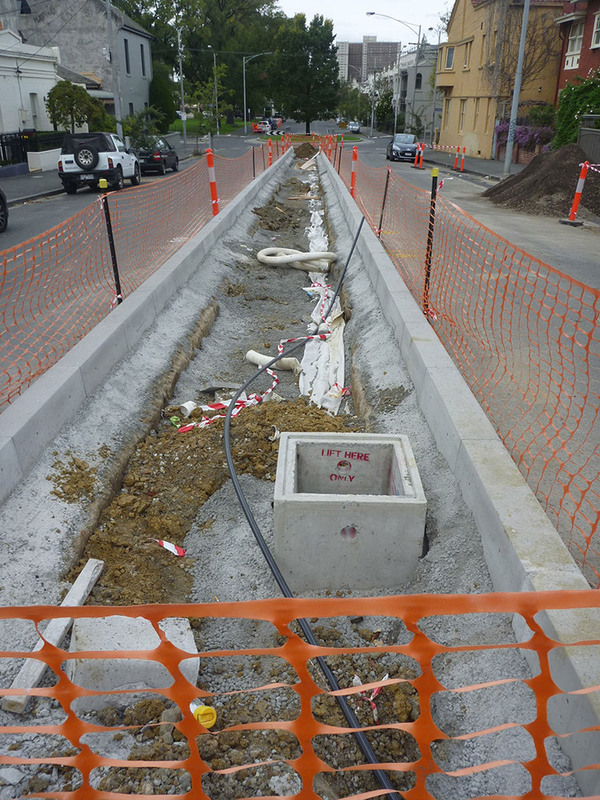 An innovative centre median design incorporates passive irrigation for new trees. Gipps Street is a 650 metre long residential street between Coventry Street and Hoddle Street in East Melbourne. A high water table in the area has resulted in waterlogged soil along the sides of the street. This has made it difficult to successfully grow trees in the footpaths. 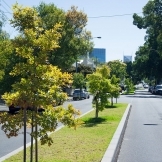 The City of Melbourne was approached by residents requesting that a centre median with trees be constructed. They wanted a consistent aesthetic with the other streets in the neighbourhood. In response to the community’s request and the waterlogging issues, a median was constructed along the centre of the street and planted with trees and grass. 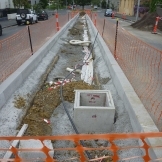 The design includes underground pipes that capture excess water from the side of the street, redirecting it to the median. This simple solution removes excess water from the root system of the footpath trees and provides passive irrigation for new trees in the centre median. This project was funded by the State Government of Victoria. 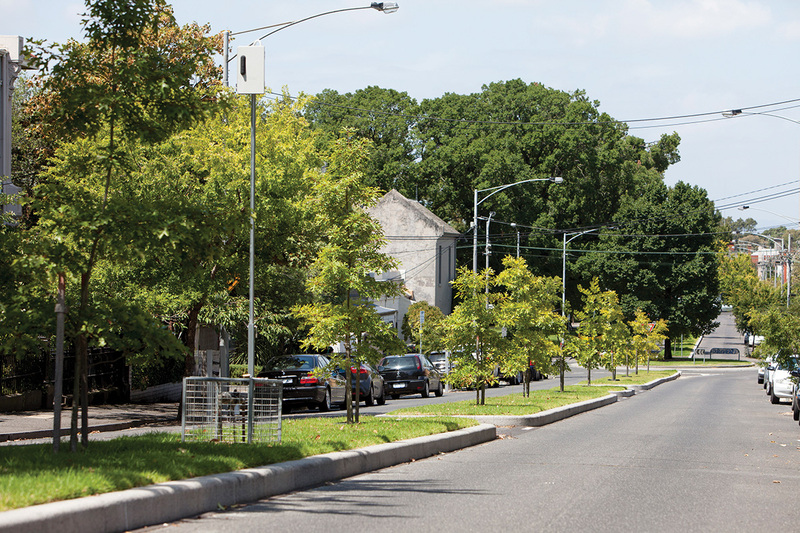 What benefits has the Gipps Street median project provided? Created a streetscape that is consistent with other streets in the neighbourhood. A high water table is present along the sides of Gipps Street, but not under the centre of the road. 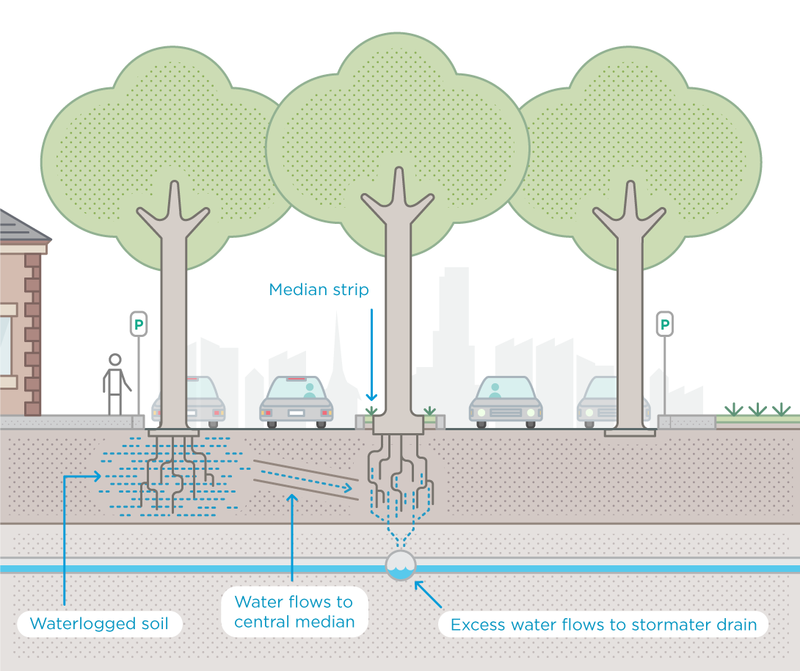 The basic design concept was to redirect excess water from the edge of the road to irrigate trees in a centre median. 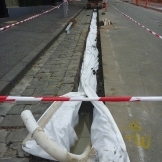 Several lengths of underground pipe were installed at intervals along the street. They direct excess groundwater to the median. The gradient of the pipes is set so that the water moves under gravity. An underground pipe also runs the length of the median, to convey water that is not absorbed into the soil along the median. This excess water is directed back into the stormwater drainage system. The passive irrigation design removes the need to irrigate the median trees, but the grass around the trees still requires watering. An irrigation system has been installed beneath the grass. It uses potable water and only activates when soil moisture is low. City of Melbourne staff and contractors completed this project. Funding support was provided by the State Government of Victoria. A number of solutions were considered in relation to the waterlogging issue in Gipps Street. These included installing a new stormwater drain or replacing failing trees with water-tolerant species. The new median was deemed to be best option. To identify the source of the excess water under the kerb, City West Water was engaged to inspect the function of the existing water main. Although the water main was old, it was not found to be leaking and eliminated as the water source. 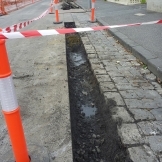 A geotechnical study was commissioned to try and work out the cause of the water pooling in the soil at the edge of Gipps Street. The study identified that a high water table was the cause. A traffic study was carried out to determine the impact of the median on traffic in and around Gipps Street. The local community was asked to provide feedback on the initial design concepts. This feedback was used to develop the final plans. Gipps Street is used for delivery access to the Mercy Hospital and a number of other medical facilities in surrounding streets. We had to make allowances in the design for truck movement and turning. In addition, we had to maintain car park access for a large residential building. The initial design was altered to allow easy access for residents. At 20 metres wide, Gipps Street is ten metres narrower than standard streets in the area. This is likely the reason that a median was not originally installed. A narrow median was designed, 2.5 metres wide rather than the usual six metres. On a standard median, trees would be planted in individual wells. In the narrower design trees are planted in a trench that runs the length of the median, providing room for the root system to grow. Consider the gradient. Usually, centre medians are raised above the kerb, so the solution we used in Gipps Street would not be possible. Gipps Street has an unusual fall that enabled gravity to passively irrigate. Gipps Street residents were engaged very early in the design process because they had requested that the median be constructed. We sent concept designs to all local residents, property owners and impacted businesses and received over 100 responses. 75 per cent of respondents asked for changes. The designs were revised, shared with the community and were received favourably. 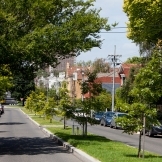 Under the Melbourne Planning Scheme, projects carried out by the City of Melbourne costing less than $1 million do not require a planning permit. The Gipps Street median project fell into this category. Underground, running from the edge of the road to the centre median at intervals along the street. Another length of pipe runs the length of the median, carrying excess water to the stormwater drains. The drainage pipe transports groundwater from the edge of the road to the roots of the trees in the centre median. the median is 2.5 metres wide. Tree plots within the median are 3 m x 1.8 m and 0.8 m deep. Tree plots are spaced at 10 metre intervals along the median. 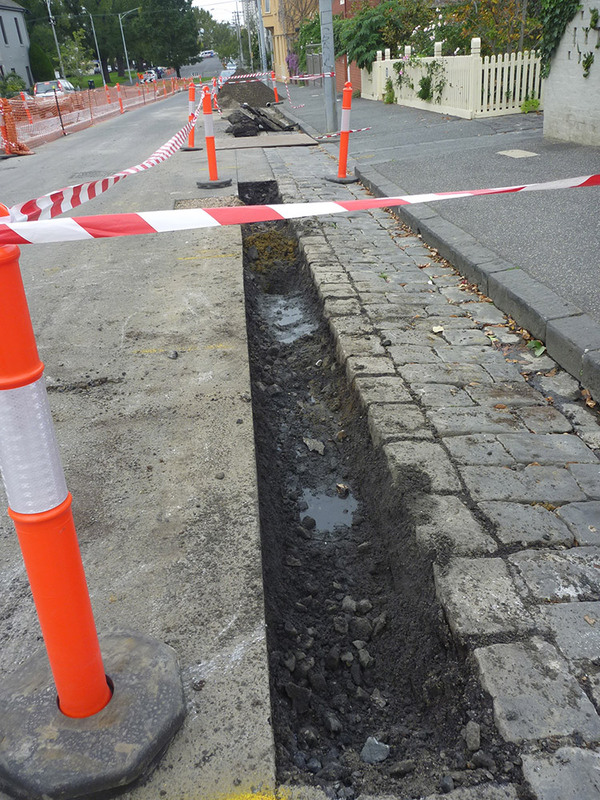 We pulled up the road base along Gipps Street and excavated the soil along the new centre median area. Specified tree growing soil was installed to provide a large root zone for the new trees. In the plots where trees were planted, the excavation was slightly deeper. We used sandy soil rather the highly organic landscape or planter mixes, because it has the inherent capacity to resist compaction. This makes it more resilient during the construction process than a loam or clay loam soil would be. Highly organic mixes were avoided, because they lose volume and undergo changes in porosity as the organic matter decomposes. This can cause problems for plant growth. Large amounts of organic matter buried deeper than 200 mm can also undergo anaerobic decomposition. This leads to poor plant growth and even plant death. 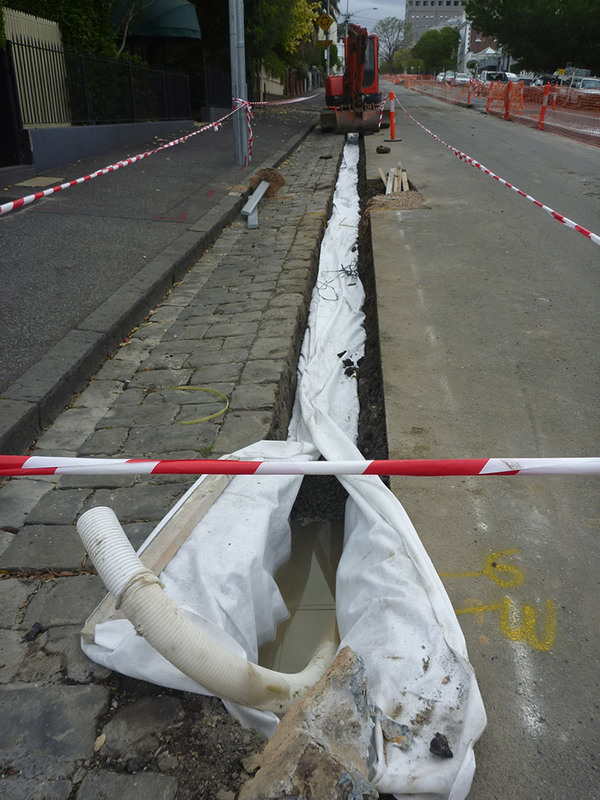 The slotted drainage pipe is wrapped in geotextile. This allows water to seep out and water the trees, while also preventing soil and roots from getting into the pipe and causing blockages. We planted Quercus coccinea (scarlet oak) in the median. It is a water tolerant tree, so it will thrive in the new median where the excess water is directed. Scarlet oak is a deciduous tree. It will provide canopy shade in summer and let plenty of sunlight through in winter after it drops its leaves. 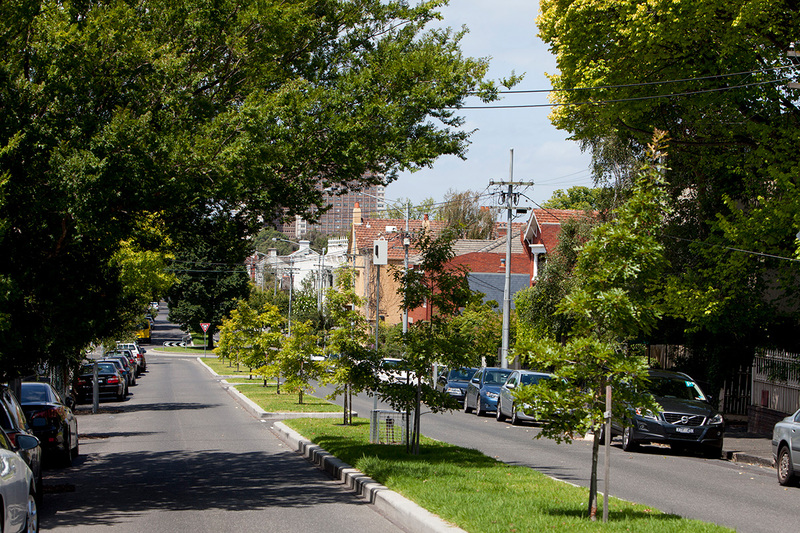 New trees were also planted along the sides of Gipps Street to replace the ones that had failed due to waterlogging. 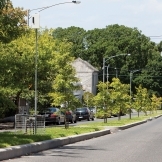 We chose Ulmus parvifolia (chinese elm) in accordance with the East Melbourne Urban Forest Precinct Plan. The total cost of the new centre median for the entire length of Gipps Street was $600,000. The passive irrigation component of this was $60,000. Aligning greening and water sensitive urban design projects with existing problems allows you to address to several objectives in one project. This efficiency provides greater value for money and helped to get internal funding approvals and funding partners. The Gipps Street passive irrigation system is very low maintenance. Filters prevent the pipes from becoming blocked. The only work required is standard maintenance of the turf and trees in the median, such as pruning. 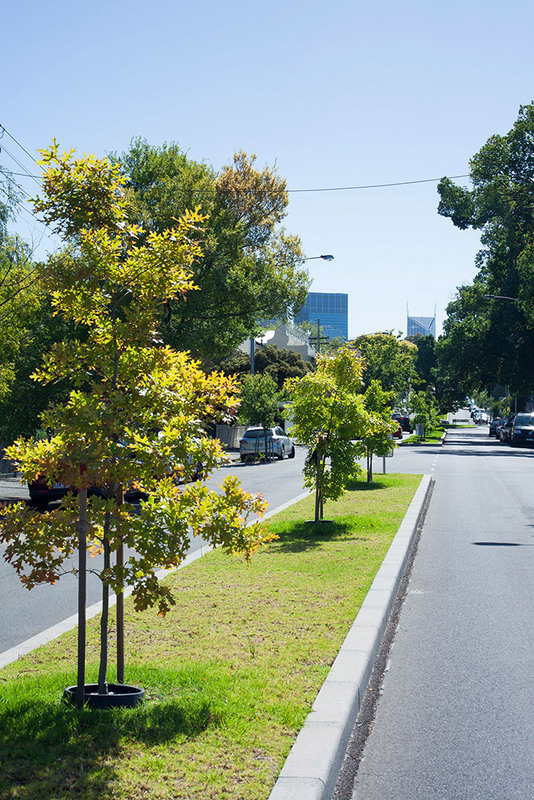 We monitor the effectiveness of the system by observing the trees in the footpaths and centre median. Since we completed the project in 2013, the trees have shown good signs of healthy growth. Click through the sections below as you go on a self-guided walking tour of our water projects in East Melbourne. You can use your mobile device to access this tour on site, or download the printable version from the menu on the right. Browse these external websites and resources to learn more about water in Melbourne, Australia and other places around the world.